César Ritz Colleges Switzerland is your hotel management school with specialisations. The perfect blend of entrepreneurship and culinary skills to create your ideal education. Culinary Arts Academy Switzerland is your cooking school. Hotel school specialized in hospitality education and business studies. Hotel Institute Montreux is your business school in Switzerland. The combination of Swiss hospitality management precision and creative design. IHTTI School of Hotel Management is your hotel school in Switzerland. Hotel, Resort, Events and Spa management programmes. Swiss Hotel Management School your hospitality management studies. Hello! Thank you for visiting my page. My name is Jovana and I am Regional Manager for Swiss Education Group in charge of Serbia, Montenegro, Croatia, Bosnia and Herzegovina, Macedonia, Slovenia, Poland and the Russian Federation. If you are interested in our programmes and a resident of one of these countries, I am the right contact for you! 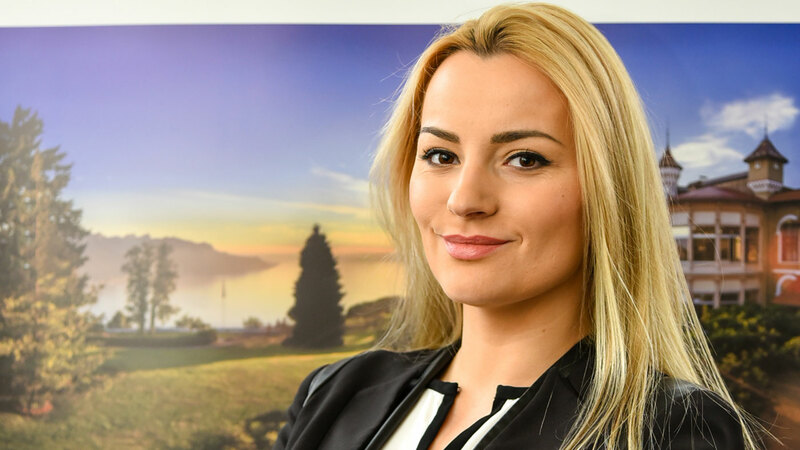 I am an alumna of Swiss Hotel Management School and Hotel Institute Montreux with more than 6 years of experience in the hospitality industry and educational consultancy. My objective is to find the right school and best programme that will match not only your future career aspirations, but also the job market worldwide. I invite you to scroll down the page to learn more about me, to understand if I could be the right person to assist you and finally to fill in the form at the bottom and I will contact you directly. We look after 5 schools spread over 7 beautiful campuses in Switzerland, with a student body made up of 111 nationalities and 6,000 students. Each school benefits from a unique location and educational experience and, with a tailored hospitality education, your 5-star educational experience starts here! Why should you study hospitality? The hospitality industry is one of the fastest growing industries in the world and is much broader than any other industry. Once you graduate from one of our schools you will be able to apply what you have learnt in nearly any company that is focused on customer satisfaction and meeting and exceeding customers’ needs. Career opportunities are endless! What makes me the right person to counsel you? I have been working in educational counseling for 6 years. My role at Swiss Education Group is to show to students how versatile the hospitality industry is and to help them find the most suitable program for them based on personality assessment that we do during our one to one session. I am personally an alumna of Swiss Hotel Management School and Hotel Institute Montreux. When I came to Switzerland 11 years ago, my desire was to study in a multicultural environment. I was passionate about the travel industry since I had the opportunity to travel all around the world with my family and see many beautiful places and meet great people. My dream was also to speak a couple of languages fluently. I didn’t really know the hospitality industry was such a broad industry when I first started my Bachelor studies. What I loved the most about my studies at Swiss Education Group is that we lived like a very big international family on campus. The school also gave me an opportunity to learn more about myself and find my passion through different internships organised after every academic year. I was lucky to work for luxury hotels, cruise lines, events companies and in the educational sector and I am confident that this list will never end! Today, I am very proud to be a part of such a versatile industry and if you feel that that this could be an interesting option for you too please feel in the form below and I will contact you directly! We start off with a counselling meeting via phone or face-to-face where we’ll discuss and find the best degree for you, based on your previous experience, your dreams and your career goals. With 5 schools across 7 campuses, there’s plenty for you to visit! Once we have decided which degree(s) are the best match for you, why not meet students and teachers and learn more about the content of the degree. You can either attend one of our Open Houses (including an organised tour of several campuses over 2 days) or book a private visit directly with me. Once you have decided which school and degree suits you best, you can apply online. Within a month you’ll get to know if you have been accepted and we will have a follow up phone meeting where we get you prepared for starting your new school. Feel free to use this form to ask a question or book a private visit.